It is always interesting to explore or visit unique destinations. There is some mysterious thing which attracts us to such places. Such is the queer attraction to these unusual beaches in India. We often love the beautiful coastal locations. Here are some bizarre beaches in India which have some unique qualities. Have you heard of bioluminescent beaches? the waves filled with bluish light hit the shores. Such a phenomenon was observed in Juhu Beach, Mumbai. Would you like to know more of such beaches?! Let us take India tour. Muzhappilangad Beach runs parallel to the National Highway - NH66 between Kannur and Thalassery in Kerala. This coastal line is the longest drive-in beach in India. Isn't it exciting when the beautiful sea becomes your travel companion?! In Chandipur beach, the waves seem to play hide and seek! The waves actually recede upto 5km during the ebb tide. This phenomenon happens twice in a day. Ofcourse, the waves do return after some time. Chandipur Beach is located in Baleswar of Odisha. St. Mary's Island is located near the coast of Maple Beach in Udupi. One can reach this island through boats from Malpe. The island is unique because of the basaltic rock (volcanic) formations. This is one of 4 prime geological zones in Karnataka. 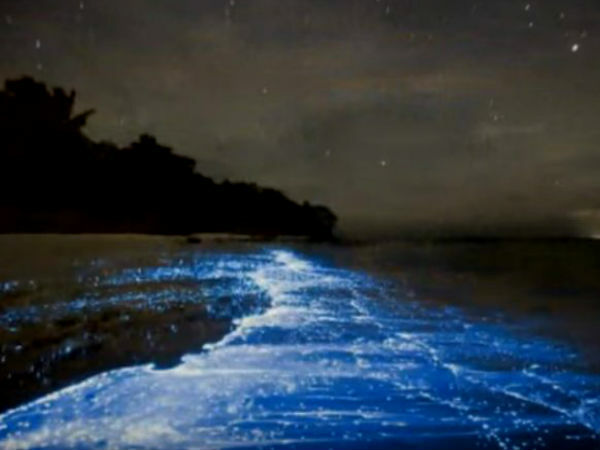 Bioluminescent waves is a phenomenon where microorganisms called phytoplanktons emits light. Due to this waves are filled with blue lights. Such phenomenon was only seen in Lakshadweep's Kavaratti island. Recently, blue waves were also seen in Mumbai's Juhu Beach! How can a sweet water lake exist just near to a beach? At a small distance from Arambol Beach, there is a hot spring which is called as Sweet Water Lake!It is also one of the attractions near this beach in Goa. Dumas Beach is one of the most haunted destinations in India. It is believed that people can hear voices and see apparitions in this beach! Dumas Beach is situated in the city of Surat in Gujarat. Om Beach is one of the popular beaches in Gokarna. It is unique because it is named after its shape. Om Beach is in the shape of the symbol of Om (an auspicious symbol in Hinduism). And interestingly, Gokarna is known for the Shiva temple. Neil's Island in Andaman is known for the natural coral bridge. This bridge looks unique and goes well with scenic island. Nagoa Beach in Diu is surrounded by Hoka trees and you won't find these anywhere else in India! Do you know why? Because they were planted by the Portuguese which they brought from Africa.